I'm not sure how many of here draw/paint but I know there are a few of you. 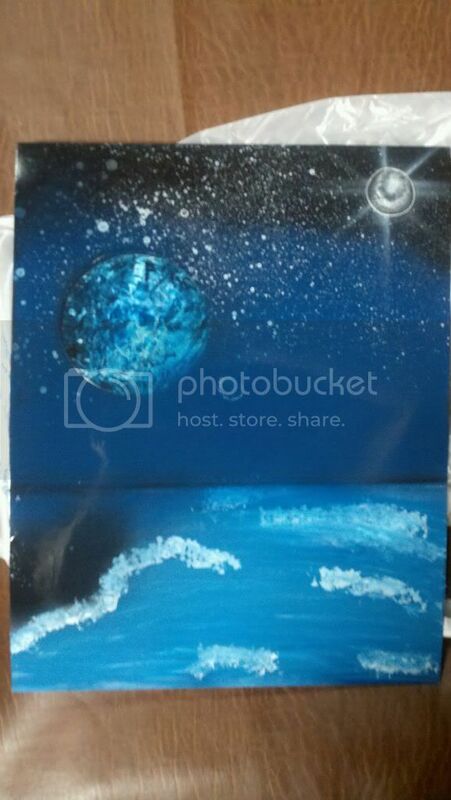 I just came across " Spray Paint" painting. Which is exactly what it sounds like, painting while only using spray paints. After researching about the "how to's" of spray painting, I tried it out for myself. On my first day I pumped out 6 paintings, each took about 10 minutes ( and I was going slow) Thats what I love so much about spray painting art, it only takes a few minutes. It's pretty simple and if I can do that ^ on my first day, anyone with a can of spraypaint and some creativity can do this. Anyways, I am just curious as to how many people already know about the art here and if any of you have started "spray" painting yourself. I've always known it as speed painting. Thought it was pretty cool so I guess now I have no choice but to give it a try. I've been doing it for a few years now, although I haven't in a while since I've been at college. I first saw a guy selling painting's like this on the street when I went to Mexico. I watched him for a good hour before I bought one, and went home and tried it myself. If you get a plastic palette knife set you can make some pretty cool designs, too. but great job though... that's museum material right there. Very cool Sparky. I do some painting but I paint models for games like 40k and Malifaux. Actually my painting business is how I pay for all my airsoft stuff so the wife doesn't complain about the money I spend. Your picture would be an awesome back drop for my models for when I sell them. It is pretty impressive what can be done in this medium. Decibel here on AO has done some sweet stuff in this style. I personally have seen it being done on cars before. I think I will stick to my brushes and canvas, though. And my needles and ink on flesh. Remember to wear some sort of mask while doing this art. Saw a youtube video of a guy doing this awhile back with no mask, while his head was less than 2 feet from his painting. Definitely not healthy! Be smart, wear protection. Yeah I've seen people spray cars, doors, clocks, walls, basically anything is an option. as ninja_fish said - You want to be sure to wear a mask if you're spray painting indoors. If you're spraying outdoors or in a well ventilated area ( i.e. garage ) the mask really isn't a necessity. however, It's definitely a good thing to have. During the great storm of 1781 John Jameson lost a barrel of his beloved whiskey, he said good bye to the crew and went in after it. In hindsight, that probably wasn't a good idea. weeks later a funeral was held, all of Ireland was in attendance. Including John Jameson. What!?!?!!!???!!!!! A self aware ANG? The Mayans were right! Time to head to the bunkers boys, its the end of days!